This holiday season, I am starting off my 2018 Holiday Gift Guide with coffee. Why? Because you are going to need it. And give it too. illy is the epitome of Italian espresso and their K-Cup Pods are amazing. You get the fresh espresso flavor in Keurig compatible pods that will last for 10 uses per box. That is 10 days of supreme coffee at a price that cannot be beat. Each Arabica Selection has it's own unique roasting temperature and length of time to highlight each origins aroma and flavor. They've perfected the roast of each single origin, or ingredient, found in their signature illy blend. The distinct roast enhances the different flavors of each Arabica: the floral notes from Ethiopia, chocolate notes from Guatemala, caramel from Brazil and fruity notes from Colombia. Because happiness is savoring the taste right from its origins. They come in two flavors, illy Brasile K-Cup Pods and illy Colombia K-Cup Pods. Brasile has more caramel notes and is not bitter in the least. That is the best thing I love about these K-Cups, they are not bitter espresso. Enjoy the extraordinary taste of illy in the convenient format of a single-serve pod designed for use in all Keurig® K-Cup® brewers. Discover illy Arabica Selection Brasile single origin coffee that individually highlights one of the unique flavor notes found in the legendary illy blend. Coffee grown in Brazil is known for its intense full flavor and notes of caramel. This sustainably grown coffee is made with 100% Arabica beans. Brazil, the world’s largest producer of Arabica coffee, is home to five billion coffee plants where well defined wet and dry seasons create the perfect climate for coffee cultivation. The roast of this origin is specially calibrated to enhance the natural aromatic notes and flavor profile of the coffee. Each box contains 10 coffee pods. Brazil is the world’s leading producer of Arabica coffee. These beans are mainly cultivated on the high planes in the southeast of the country, where the marked alternation of dry periods and heavy rains provides perfect growing conditions for the plantations. The Colombian flavor has more fruity notes and is also not bitter in the least. They are both intense and full flavored. Now enjoy the extraordinary taste of illy in the convenient format of a single-serve pod designed for use in all Keurig® K-Cup® brewers. 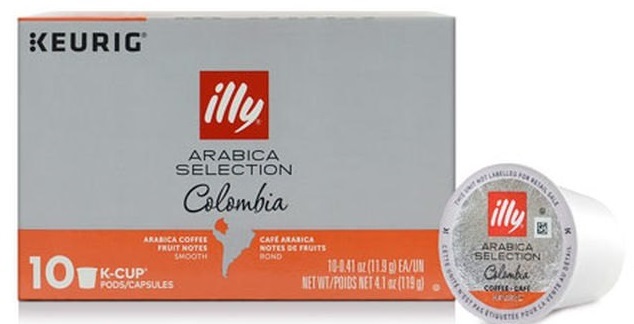 Discover illy Arabica Selection Colombia single origin coffee that individually highlights one of the unique flavor notes found in the legendary illy blend. Coffee grown in Colombia is beloved by coffee connoisseurs for its subtle sweetness, smooth finish, and beautiful tasting citrus notes. This sustainably grown coffee is made with 100% Arabica beans. Colombia, a sought after origin, grows 10% of the world's Arabica coffee thanks to its uniquely beautiful flavor profile. The roast of this origin is specially calibrated to enhance the natural aromatic notes and flavor profile of the coffee. Each box contains 10 coffee pods. The variety of soil, altitude and climate found in the mountain ranges of Colombia provide a unique environment for the cultivation of a coffee with a rich taste and aroma. These coffees make the perfect pick me up for the morning. Or for the afternoon doldrums that kick in. Either way, now you can easily brew a cup of espresso in your Keurig that tastes as good as what you would find in Italy. Almost as good. The only thing missing is the crema. These would make an excellent holiday gift for any coffee lover. I know I would not mind seeing a few boxes of these wrapped up under the tree or in my stocking. I could say the same for my ex-husband, another coffee connoisseur. 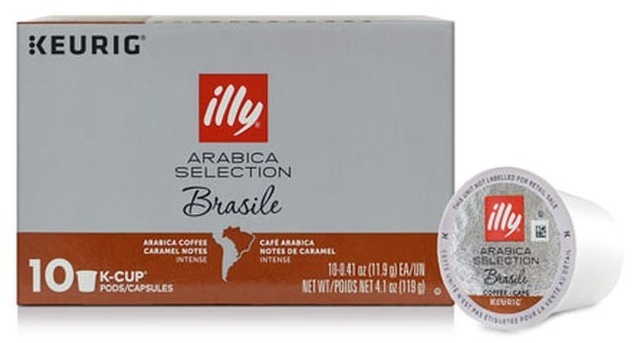 illy Arabica Selection Brasile & Colombia Espresso for Keurig can be purchased online at www.illy.com. Like illy on Facebook: https://www.facebook.com/illyusa; Follow illy on Twitter: @illyusa; Follow illy on Instagram: https://www.instagram.com/illy_coffee/ and Subscribe to illy on YouTube: https://www.youtube.com/illy.